Depending on where you call home, today might just be your day off, thanks to May 2-4. The glorious kick off of the summer season. If you're not Canadian, you're not quite as lucky (sorry!) Regardless, summer is coming, and with it comes the sun. While a bit of sun is most definitely welcome, it's damage isn't. Obviously, sunscreen is your friend, but what about your hair? The sun wants nothing more than to eat away at your fabulous hair colour (at least, I imagine it does.) What's a girl to? Trust the bum. Sum Bum that is. They've got a slew of sun protection products to see you through the summer, including some excellent hair care. 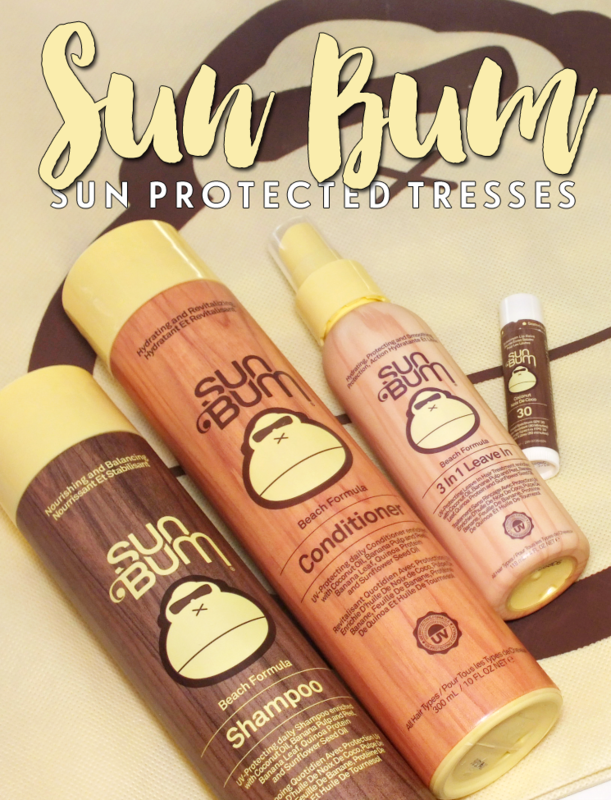 Sun Bum makes protecting your hair incredibly easy, as they're Beach Formula Shampoo and Conditioner both offer UV protecting properties. Both also rely on a formula enriched with coconut oil, banana pulp and peel, banana leaf, quinoa protein, and sunflower seed oil. And yes, in case you're wondering, they smell incredible! The scent is a combination of coconut, vanilla, and banana for tropical vibes. The shampoo, while being UV protective, also works to cleanse hair from saltwater, chlorine, and environmental pollutants you may have exposed it to during your summer fun frolicking. The colour-safe formula (yay!) can lock in colour, strengthen hair, restore lost moisture, and provide humidity-resistant frizz control when used regularly. It's basically your hair's new BFF. The conditioner, again is UV protective, but also offers up deep hydration while locking in colour and repairing damage. The formula leaves hair feeling silky, easily brush-able, and smooth without being heavy on finer hair. Post shampoo and conditioner, the Beach Formula 3-in-1 Leave In gives hair an added je ne sais quoi. The Leave In does a bit of everything as it protects, detangles, and conditions hair while enhancing and restoring natural body. It also works to reduce frizz, slow colour fading, and prevent split ends from forming. It has the same coconut, vanilla, banana scent as the shampoo and conditioner, and a lightweight feel that won't leave your hair weighed down. I say this product is a must have for lazy summer styling, especially when you skip the heat. Last up, a little something for lips. I know, they're not hair, but when you come across a lip balm with SPF 30, you snag it. 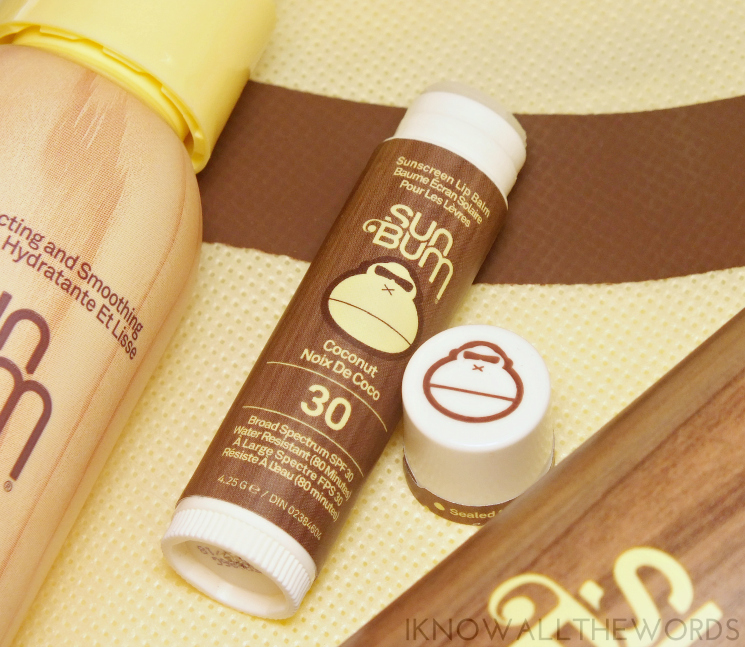 The Sun Bum SPF 30 Lip Balm not only has a higher SPF than most, but it also boasts a water resistant formula (up to 80 minutes) while being gluten, cruelty, and paraben free. The Coconut flavour isn't a straight coconut, but something more like a Pina Colada as it has a pineapple thing happening too. The balm has a light texture, gives a bit of shine, and a delightfully sweet taste. Should coconut not be for you, it's also available in banana, key lime, mango, pink grapefruit, and pomegranate. 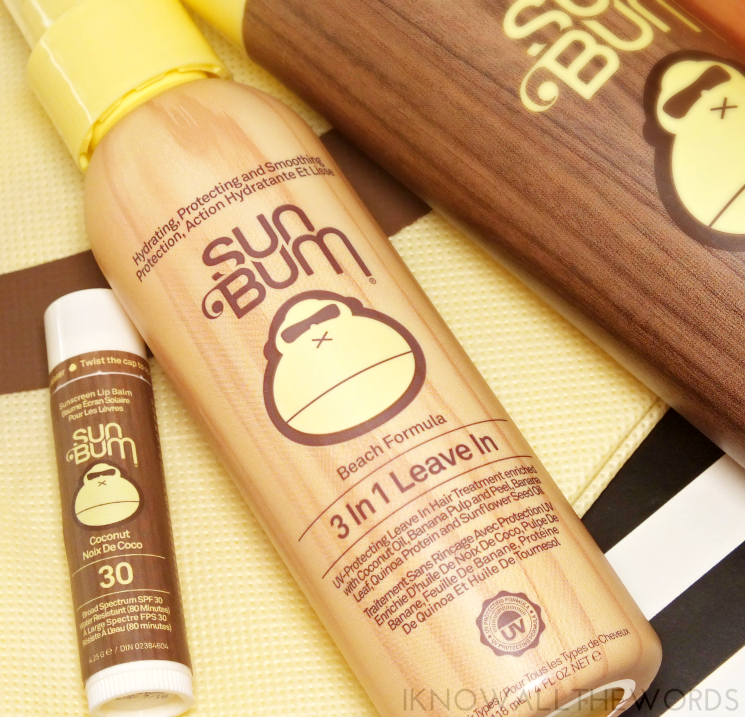 I've been really impressed with these Sun Bum products and will be adding more to my sun protection lineup soon. You can't beat that they offer high SPF options (up to SPF 70) and a variety of formulas (like stick, spray, and traditional lotion.) Sun Bum is now available in Canada (yay!) at select specialty stores and Shoppers Drug Mart. 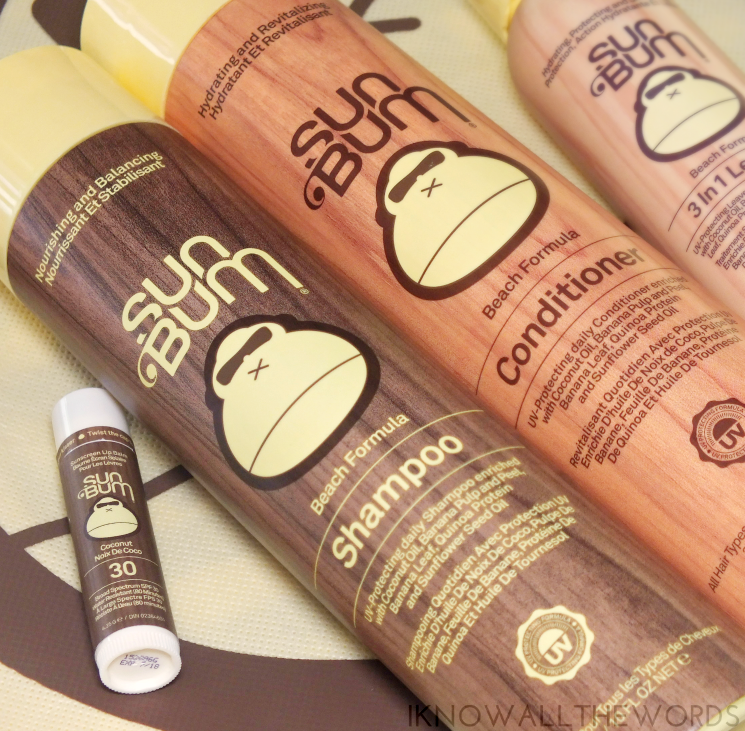 Have you tried anything from Sun Bum? Do you have a go-to brand for your SPF needs?